Psychology works. I’m pretty darn good at reading customers' minds, intuiting intentions, understanding cognitive biases and shaping a successful landing page. Customers are smart. They aren’t psychological marionettes. We can’t dangle carrots or expect them to jump when we say “jump.” I have a great respect for the mental acumen of other people. So, let’s go to that second point — customers being smart. Some Internet marketers and conversion optimizers think that they can whip up a few psychological tricks, use a few select words, make their CTA buttons orange, and voila! Conversion buckets! If you think you’re being all sick and awesome with your psychological tricks, then you need to realize that there is a precision instrument dwelling in the prefrontal cortex of most digitally aware human beings alive in the 21st century. 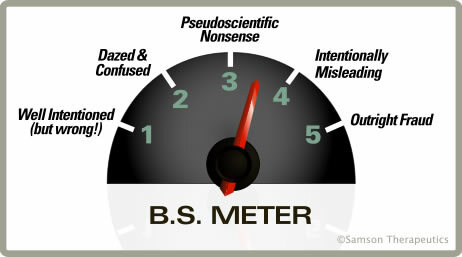 It’s a BS meter. What I’d like to do is tell you a few of the things that customers hate, despise, malign, mock and spend time plotting against. Many landing pages completely miss the mark. They create in humans a sense of loathing disgust. See if there are any features you’re guilty of, and find out how to correct them. 1. The CTA is hard to find. Quick, what’s the most important button on your entire landing page? Answer: The freaking call-to-action button. It makes sense, then, to hide that button, make it small, shove it to a dark and dusty corner, or maybe just leave it off altogether. What’s really going on? It’s poor design, probably. And it’s also a lack of awareness about landing page best practices. Some people try to stuff everything into a landing page, thinking that if you throw enough conversion mud on the landing page wall, some of it will stick. Let’s take a look at some CTAs that got lost in the war. Here is an actual landing page that I accessed on March 20, 2015. I had to screenshot this thing. Let’s see which of the 180 links I should click on to not get what I want ... eeny, meeny, miney, mo. Here’s another landing page. I still haven’t found the CTA. Nice blog, man. Loser landing page. Just make your CTA big, bold and prominent. And you’ll be okay. 2. You have way too much copy. Customer: I don’t have time to read this @$%#! I’m as much a fan of the long-form landing page as the next guy. If you doubt my integrity on the point, please read my well-researched article on the subject so your mind will be blown. While there is something to be said for nice juicy long landing pages, there is also something to be hated in landing pages that have too much boring content that zero people will read. Part of it is the presentation. Is the content well-written? Is it broken up into chunks? It is relevant? If not, then the customer doesn’t have time to read it. Not only will they not convert, but they might actually say bad words about you and your website. You want example? Me have example. And to the customer, that’s also BS. Customer’s don’t need rhyming little headlines. They need information that fills a need. If you are going to the effort of hiring a copywriter to write nice things, then please don’t have him or her waste time writing inane copy. And if you want more copy, then go for it. Don’t try to be cute. Clarity is better than anything else in the world. If you can say it in fewer words, do. 3. There is ZERO flow. Customer: My word! What do I do? Where am I? All this information coming at me ... aagh! Some landing pages have a palpable lack of flow. A successful landing page is created with purpose. The page clearly lays out information in a structured and intentional way. The landing page developer (guided by the caring wisdom of a CRO) shapes a headline, selects an image, writes a subheadline, develops a button, and weaves together the copy — all in a symphony of order and intention. I encourage conversion optimizers to do the same thing. Instead of just making a landing page, we should make an experience that presents to the user the right thing at the right time. Eye path — The way a customer moves his or her eyes to each element on the page. Cognition —The process of mental awareness and consideration. Brief explanation paragraph or bullet points to further develop the point made in the headlines. Now, let me show you that same page annotated with my sarcastic criticisms. The page has entirely no flow whatsoever. The page asks appropriate questions and provides cogent answers. It successfully tracks the thought process of the user, and delivers relevant information. Customer: I don’t care about your company. Self-promotion doesn’t sell. A customer is thinking about one thing — themselves. If your landing page doesn’t satisfy their narcissism, then you've lost the game. A customer clicks on a landing page to fulfill a need. With that overall intent in mind, what kind of information should you give them? Ooh, I know! A story about how we were founded by your great grandfather 1932 on principles of hard work, values and quality! Yes, oh yes! Let’s get this straight. Your customer cares as much about your company as you care about dryer lint. Which is to say, not a whole lot. Don’t waste landing page space by talking about yourself. Utilize landing page value by talking about the customer. Here’s an example of a landing page that doesn’t get it. Too much talk about stupid stuff, and not enough talk about giving the customer something that they want and are interested in. Customer: What is this @$%# thing? I want to know! The too-much-information problem has its flip side: Too little information. If your page does not answer those questions, then you lose any and all chance of a conversion. As discussed above, each landing page should be developed in such a way that it guides the user through a process — the flow. Answer questions, address objections and satisfy needs. If you have too little information, the customer will not convert. With all due respect to Salesforce, this landing page fails to answer any questions. It raises plenty of questions, but there is no delivery of information, just an obtuse CTA and an obnoxious form. Why does this landing page not work? Because I have no idea what it’s about. Marketing cloud demo. Okay, yes, but marketing is huge. What about marketing? CRM? Sales? SEO? Billboards? Please, will someone answer my questions? No, I don’t want to have to call that number to get my questions answered, because I don’t even know where I’m supposed to begin. What is this all about anyway? Don’t do that to your customers. Answer the biggest and most important questions, and then let them decide whether they want to convert. 6. Provide a clear path to the goal. Customer: I don’t want to fill out your @$%# survey. I’m going to lead this section off with a screenshot. Find out what’s wrong with this landing page. You have a half-second. Go. Yeah, they actually fenced off their landing page with a survey request. Don’t ever, ever, ever ask a customer to fill out an opinion survey when they come to your landing page. You want an example of what that’s like? This is a landing page, folks, not an opinion survey. I’m not opposed to popups, but if you put a self-serving one on your landing page, you’re shooting yourself in the foot. 7. CTA buttons with no CTA. Customer: What does this button do?! I’m a champion of making CTA buttons really powerful. At the beginning of this article, I discussed the importance of having an easy-to-find CTA. But, what good is an easy-to-find CTA if that CTA confuses the user once they see it. Let me show you something that I do not recommend. So, do you see that button? Yes, let’s leave aside the fact that the copy is tl;dr. Try to also ignore the tiny size of the button. Please, we’re not discussing the fact that the CTA is a shade of gray color, which makes it nearly indistinguishable from any other boring element on the page. Let’s focus on one thing: The button copy. It stinks. Most law-abiding, tax-paying customers don’t want to click on buttons that leave everything to the imagination. What is the Oracle Customer Experience going to do? If you don’t know, don’t do. In contrast to Oracle’s Button of Mystery, here’s Zoho to the rescue with a good example. 8. Make your headlines clear. Customer: Finish the sentence! What is it about?! While we’re talking about clarity, it’s important that your headlines be as clear as possible, too. Opaque headlines have been known to inspire zero people in the history of the world. If you write a headline, and the user feels compelled to scratch their head in confusion, then you lost. A headline should be clear and compelling. Ready for the bad example? So, for a brief lesson in landing pages, allow me to say it once more: Make your headline clear. 9. Lay off the forms. Customer: My eyes! Too many form fields! Too many form fields are the bane of many a landing page. It’s okay to have forms on your landing page. It’s probably not okay to obliterate the user's mind with massive forms. Although forms are essential, they are also conversion killers. Landing pages that reduce the quantity of their form fields improve their conversion rates. When Expedia nixed a single field (company name) from their form, they earned as $12 million profit. When you reduce your form fields, your conversion rates will go up. You don’t really need all that information. Your customer loathes you for asking, and you will hate yourself for keeping the forms as long as you did. They are keeping you from higher conversion rates. Your customers are smart, sophisticated and BS-whiffing people. They know what matters. They know what they want. You owe it to them to provide the best landing page experience possible. Your homework is simple. Go to your landing pages. See if you have any thing on this list of iniquities, fix them, and then let the conversions roll in.